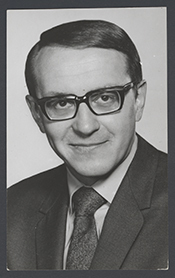 BEGICH, Nicholas Joseph, (father of Mark Begich), a Representative from Alaska; born in Eveleth, Saint Louis County, Minn., April 6, 1932; attended the Eveleth public schools and Eveleth Junior College; St. Cloud State College, St. Cloud, Minn., B.A., 1952; University of Minnesota, Minneapolis, Minn., M.A., 1954; doctoral work at the Universities of Colorado and North Dakota; high school instructor, counselor and director, student personnel, 1952-1959; principal and superintendent, Fort Richardson Schools, Alaska, 1959-1968; part-time instructor, University of Alaska, Anchorage branch, 1956-1968; builder and manager of apartment houses in Anchorage beginning in 1968; elected to Alaska State senate for two four year terms, 1963-1971, serving as minority whip from 1967; elected as a Democrat to the Ninety-second and to the Ninety-third Congresses; disappeared while on a campaign flight from Anchorage to Juneau, Alaska, October 16, 1972; served from January 3, 1971, until December 29, 1972, at which time a presumptive death certificate was recorded in the State of Alaska. Papers: In Begich family papers, 1940-1972. 10 cubic feet. Encompasses both the business and public life of Begich, including his years as an educator in Minnesota, his political and educational activities in Alaska, and congressional service. Copies of materials owned by family. Papers: In the Karl Grittner Papers, 1951-1972, 2.5 cubic feet. Other authors include Nicholas Begich. An inventory is available in the repository. Papers: 1970-1973, 80 cubic feet. The Nicholas Begich Collection contains congressional papers and correspondence, portraits, and memorabilia. A finding aid is available in the repository. Papers: In the Guy R. Martin Papers, 1971-1972, 3 cubic feet. Legislative research files and related material of Guy R. Martin, legislative assistant to Nicholas Begich. Included are published material, newspapers, committee reports relating to Alaska Native Claims Settlement Act, the Ocean Mammal Protection Act, and various fisheries and Alaskan land and resource issues. A finding aid is available in the repository. Oral History: March 1965 and October 7, 1972. Interviews of Nicholas Begich by his son, Tom Begich. Oral History: In the Kathleen Carlson Drabek Interview, 1994, 1 sound cassette. Subjects include Nick Begich. Oral History: In the Jim Pepper Interview, 1991, 2 sound cassettes. Subjects include Nick Begich. Oral History: In the Emil Kowalczyk Interview, 1985, 2 sound cassettes. Subjects include Nick Begich. Oral History: "A Living Tribute to Nick Begich." January 7, 1973. Copy of a recording KFQD Radio (Anchorage) produced for Nicholas Begich. Oral History: In the Grandma Begich Interview, 1981. Subjects include Nick Begich. Interview conducted by Tom Begich. Oral History: In the Dorothy and George Biondich Interview, 1982. Subjects include Nick Begich. Interview conducted by Tom Begich. Oral History: In the Ed Isenson Interview, 1982. Subjects include Nick Begich. Interview conducted by Tom Begich. Oral History: In the Jendro and Pfunnanstein Interview, 1981. Subjects include Nick Begich. Interview conducted by Tom Begich. Oral History: In the Pohjola Interview, 1982. Subjects include Nick Begich. Interview conducted by Tom Begich. Oral History: In the John Rader and Bill Tanner Interview, 1982. Subjects include Nick Begich. Interview conducted by Tom Begich. Begich, Thomas Scott. Second Term: The Life of Nick Begich: Towards a Generational Theory of History. N.p. : T.S. Begich, 1982. United States. 93d Congress, 1st session, 1973. Memorial services held in the House of Representatives and Senate of the United States, together with tributes presented in eulogy of Nick Begich, late a Representative from Alaska. Washington: Government Printing Office, 1973. Ralph Nader Congress Project. Citizens Look at Congress: Nick Begich, Democratic Representative from Alaska. Washington, D. C: Grossman, 1972.